There’s a reason New Jersey is called The Garden State – it’s not a misnomer. And there are a plethora of locations for photogenic opportunities. New Jersey has variety – every season offers something unique and special. Visiting the same place throughout the year – spring, summer, fall and winter – will give you a totally different experience every time you go. The photographic possibilities are limited only by your own imagination. IMPORTANT TIP! Since publishing this article, we created the ULTIMATE tool for planning a photography trip to New Jersey. It's called Really Good Photo Spots. 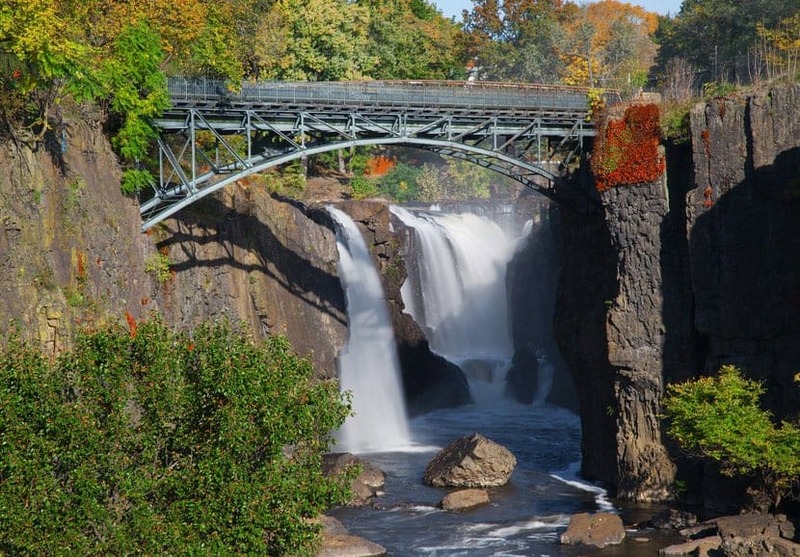 It's a free iPhone and iPad app with THOUSANDS of the best photo locations in the world all in one app.–but NJ is especially well-covered with dozens more spots than just what is in this article. It's really convenient for travel photography because you can just tap “Spots near me” and BOOM! It lists all the best spots to take pictures near you. Download really Good Photo Spots for the iPhone or iPad right here. Carved out during the last great ice age, the Great Falls were a catalyst to America’s industrial revolution. Alexander Hamilton was the architect behind Paterson becoming America’s first planned industrial community. While the textile industry is long gone, the majestic eight-story waterfall is as powerful as ever. While it’s great to go anytime to photograph the falls, a trip during a cold spell during winter is a particular treat – see the falls frozen! A humble park, which is currently undergoing renovation and due to be completed in late 2014, surrounds the waterfall. Step into the Lockwood Gorge and you step into another world. The Lockwood Gorge is one of the most picturesque places in New Jersey. Nestled between High Bridge and Califon in Hunterdon County, the easily accessible gorge is known for its trout fishing. But large boulders, steep slopes and a river with small rapids and waterfalls give rise to endless photo opportunities. The 2.5 mile stretch of the south branch of the Raritan River provides a sense of isolation and peace due to its slopes on either side studded with hemlock trees. One of the top Ivy League schools in the country, Princeton University is an architectural dream for a photographer. Located one hour from New York and Philadelphia, Princeton University is situated on 500 acres .Most of the buildings are designed in the collegiate gothic motif with sweeping arches and walkways. At the southern edge of the campus is Lake Carnegie, a man-made lake named after Andrew Carnegie and host to the Princeton rowing and crew teams. The Princeton University chapel is a glorious creation reminiscent of an English church in the Middle Ages with its carved woodwork, stained glass windows and limestone and sandstone interior. Sandy Hook is a thin barrier peninsula located in the lower section of New York Harbor. Sandy Hook, discovered in the early 1600’s by the famous wayfarer Captain Henry Hudson, has a wonderful view of the Manhattan skyline. As part of the Gateway National Recreation area, Sandy Hook has bikeways, walkways, salt marshes and more than 300 species of birds. 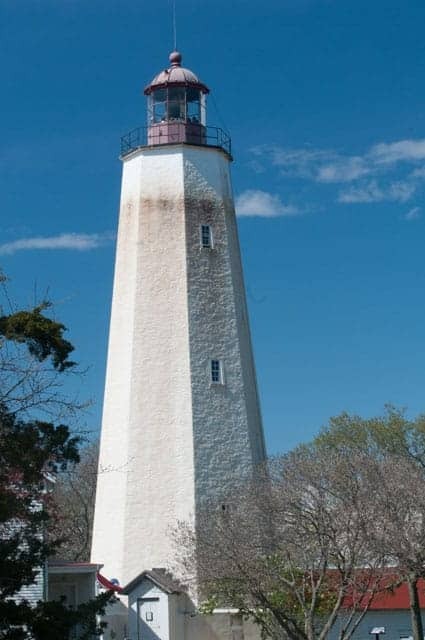 One notable resident is the Sandy Hook Lighthouse, built in 1764 as part of the installation for Fort Hancock which guarded New York Harbor until the U.S. Army deactivated it in 1975. Look for photos of sunsets, beaches, birds and abandoned buildings. Sandy Hook Lighthouse. Photo by Andrea Blasko. The Palisades are the most prominent geologic feature in New Jersey, with sheer cliffs of basalt formed 200 million years ago overlooking the lower Hudson River. The cliffs stretch from northward from Jersey City in New Jersey to Nyack, N.Y., approximately 20 miles. There are two major paths for hikers as well as lookouts for photographers to appreciate the beauty of the region and take in the sweeping vista of the New York skyline. Take a drive along the Palisades Interstate Parkway and pull over in one of the three scenic lookout points over the Palisades about where Manhattan Island begins at the Harlem River to enjoy the view. Millions of years of erosion, uplift and glacier activity helped carve out the Delaware Water Gap which bridges New Jersey and Pennsylvania. The river and valley are vacation hotspots for the nearby streams, rivers, waterfalls and ravines, crowded with hemlock trees and rhododendron bushes. Quaint Cape May sits at the very southern tip of New Jersey where the Delaware Bay meets the Atlantic Ocean. The Cape May Lighthouse, Sunset Beach and Victorian bed and breakfasts are some of the offerings. There is also a nearby wildlife area, the Higbee Beach Wildlife Management Area, for those interested in photographing birds and insects in addition to the architecture, beaches, waterfronts and a marina. The color red just pops in a photo and the Red Mill in Clinton doesn’t disappoint. Part of Hunterdon County, Clinton is located on the South Branch of the Raritan River where the Red Mill has produced grain, plaster, talc and graphite since it was built in 1810. You may even catch some flyfishermen in the river as an added appeal. Want up close views of the George Washington Bridge? Stop off at the Fort Lee Historic Park which offers cliff top views, a reconstructed Revolutionary War encampment and a Visitor Center. It’s a 33-acre park that offers stunning views not only of the George Washington Bridge but the Hudson River and the skyline of upper Manhattan. Like to photograph military items? Go to the southern portion of the park where there is a reconstructed blockhouse to gun batteries and firing steps as well as an 18th century recreated soldiers’ and officers’ huts. Sown in the spring, sunflowers bloom in the fall sometimes with their stalks stretching seven feet high. There are currently more than 200 acres in New Jersey which offers a boost to the state’s agri-tourism. In the Northeast part of the state lays Augusta and its 70-acre sunflower maze of 1.5 million flowers. And don’t forget to stop across the street at Roseline's Farm & Bakery for farm fresh baked goods. Then take a meandering drive along some of the back roads and discover some abandoned barns. Located in Chester Township in Morris County, Willowwood is open year-round offering visitors 2,100 different native and exotic plants. A former country estate, the 130-acre arboretum offers formal gardens, an undisturbed forest and open rolling fields of wild flowers. Oak, maple, willow, maple, magnolia lilac, cherry and a Dawn Redwood tree are just some of the species. It’s known as “the rainbow on the hill” with its 14,000 irises, 3,000 varieties and 100,000 blooms over the course of the season. The seven and half acre park is located in Montclair. Bring a diffuser as the flowers are in direct sunlight. June is the month to visit the Brookdale Park Rose Garden, located in the Montclair section of the park. The intimate garden has more than 700 rose bushes of 100 different varieties of roses. Home to the Morris County Parks Commission, the Frelinghuysen Arboretum offers 127 acres of trees, shrubs, flowers and nature trails circling a magnificent Colonial revival mansion in Morristown. One of the lesser-known arboretums, Reeves Reed is tucked away in Summit. Its 13.5 acres offers early 20th century landscape architecture, also known as the Country Place Movement. There is a formal garden, azalea garden and a greenhouse as well as sculpture from local artists. One of America’s foremost inventors, Edison’s laboratory complex is now a museum in West Orange. Explore three floors of the Main Building as well as the Chemistry Lab and Edison’s nearby home, Glenmont Estate. Explore the 29-room Queen Anne style mansion and grounds and outbuildings. Note – no tripods are allowed in the museum. Keep an eye out on the National Park Service website for free admission days. Not widely known, the Leonard J. Buck Garden is one of the East Coast’s premier rock gardens that have just gotten better as it’s matured. There are wildflowers, ferns and exotic plants spread over the 33-acre wooded stream valley. The garden was named after its owner, Leonard J. Buck, who worked with renowned landscape architect, Zenon Schreiber, to create an ecologically correct garden that did not have the appearance of being man-made. Each outcropping is slightly different – perfect for a photographer looking to practice their macro skills. Outdoor and nature photographers can spend the entire day without running out of opportunities. Waterloo Village is a restored 19th century canal town in Byram Township (Sussex County) featuring gristmills and sawmills, a general store, blacksmith shop and several historic houses. There is a small aqueduct that crosses the old canal lock for those photographers looking for a water feature to practice long exposure shots. Large boulders flank the Black River which runs through the middle of the park creating great waterfalls. Eastern Hemlock and Oak dominated the densely-wooded area which becomes even more picturesque in the fall when the leaves turn color. Want a bit of the British countryside in America? Stop off in Frenchtown, located in Hunterdon County. Frenchtown is where the Delaware and Raritan Canal begins. Rolling green hills and lush riverbanks and a quaint town is the appeal. Another nearby town is Lambertville, known for its eclectic mix of antique galleries, coffee shops and Victorian homes. Architecture, street performers and the banks of the Delaware River give rise to photo opps. Like history with your photography? Go to Jockey Hollow in Morristown – the place where General George Washington and the Continental Army made camp from December 1779 to June 1780 where they survived through the coldest winter on record. There are more than 20 miles of hiking trails that lead to an authentic 18th century house and replicas of the Continental Army huts. Also part of the Morristown National Park is the site of Fort Nonsense, which has stunning scenic vistas of Morris County and the surrounding verdant rolling hills. On a clear day, Manhattan can be seen in the distance. Albuquerque isn’t the only place with balloon festivals. The New Jersey Festival of Ballooning held in late July is a three-day festival that features more than 100 balloons from around the world. Held in Readington, the festival allows a free pass for amateur photographers Friday morning at sunrise. Hop onto a balloon ride for a try at aerial photography. Branch Brook Park. Photo by Andrea Blasko. The Great Swamp National Wildlife Refuge, 7,600 acres of protected land, is home to a variety of wildlife and fauna – fish, frogs, turtles and foxes, migrating waterfowl – are among the inhabitants – a nature photographer’s idea of heaven. The Great Swamp is not entirely swampland but a combination of marshes, meadows, dry woods and brush-covered swamps. Visitors can walk on trails and over boardwalks. Duke Farms is a sprawling 2,740 acres of private-owned parcels of land. The Hillsborough sanctuary was owned by the late heiress Doris Duke. The Doris Duke Charitable Foundation renovated the property and opened it to the public in 2012. The estate features the Old Foundation, an orchid hothouse, the Old Hay Barn which features Grecian sculptures and the Orientation Center, which was once the stables. If you like macro photography and shooting flowers, Colonial Park packs a wallop in a small punch. On just one acre of land, there are 325 varieties of more than 300 roses. The rose garden is a popular venue for wedding photographers. Liberty State Park in Jersey City, which encompasses 1,212 acres in the three counties of Bergen, Essex and Hudson, is bordered by water on three sides by the Morris Canal Big Basin on the north and the Upper New York Bay on the south and east. Waterfront views of Manhattan, Ellis Island and the Statue of Liberty are grand just as the very poignant memorials to 9/11 and the Holocaust. Not widely known is Sayen Gardens which bursts to life in the spring with more than 250,000 flowering bulbs, 1,000 azaleas and 500 rhododendrons as well as ponds, bridges, gazebos, and walking trails. Fanciful and whimsical, the Grounds for Sculpture marries contemporary sculpture with nature. More than 270 sculptures are on exhibit on the grounds which also feature life-size bronze statues and a lake and the Meadow, a seven acre outdoor gallery of contemporary art amongst an untamed landscape. Another little gem, the Hartshorn Arboretum offers a unique terrain of kettle moraines and a natural amphitheater carved out eons ago by the Wisconsin glacier. Migrating birds flock in the spring to join native wildflowers, rare ferns and 275-year-old tulip trees. 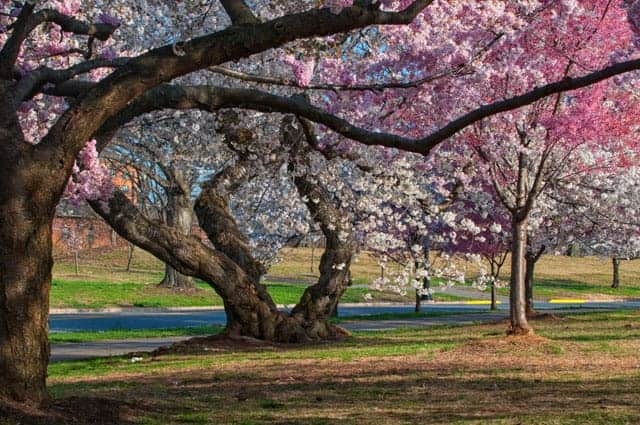 While the cherry blossoms in Washington, D.C. grabbed all the acclaim and headlines, New Jersey’s Branch Brook Park actually has more cherry trees than the nation’s capital. Branch Brook Park, which spreads out into Belleville and Newark, has more than 2,700 Japanese cherry blossom trees that burst into pink and white annually in April. There’s also an annual Cherry Blossom festival with vendors, clowns and music. The park was designed by the famed landscape architectural firm of Olmsted Brothers, a successor to Frederick Law Olmstead, the designer of Central Park in New York City. It’s a glorious site to capture photographically. Batsto Village is located in the south-central Pinelands region of the Garden State and can trace its roots back to 1766. Step back into time to photograph restored buildings, a gristmill, general store, an ice house, blacksmith, sawmill and a 32-room mansion featuring elegant Italianate style of architecture. There is also a nature center which offers canoe rides for guided nature trips on the lake. Looking for something different? Every Friday night step back into the ‘50s when Classic Cars cruise down Main Street in Somerville. The annual summer event draws people of all kinds into the festive atmosphere where restaurants have tables and chairs out on the sidewalk as well as summer concert series. Great candid street photography opportunities as well as the main attraction – classic cars. The 47,000 acres of protected land is located on New Jersey’s southern coast and is devoted to conserving the region’s fish, wildlife and plants. Avian photographers will get a unique chance to photograph shorebirds such as the Piping Plover, the American Black Duck and the American Brant. The salt marsh is also a nesting habitat for ducks, geese, herons and egrets. Every season offers a different photo opportunity – spring when the marsh grasses begin to green attracts gulls and ospreys; the turtles come out in the summer months; falls attracts the Monarch butterflies as the leaves burst into brilliant yellow, orange and red and the winter when you can photograph the Black Ducks, owls, diving waterfowl and even a Bald Eagle. The Meadowlands Environment Center in DeKorte Park in Lyndhurst offers a variety of photographic possibilities with sunsets, birds, butterflies and wildflowers. There is even an observatory, the William D. McDowell Observatory, where clear skies can give you shots of the moon and the night sky. The marshlands give a nature photographer a wonderful opportunity to capture marshes, sunsets, flora and fauna. Article written by Andrea Blasko.